The origin of the medal goes back to the days of St. Benedict himself. (6th century) not that he made such a medal, but his reliance on the power of the cross of Christ is the main features on the medal; as narrated by St. Gregory the Great. The forms of the Medal are varied. But the most known and the most enriched of indulgences is today the one struck in 1880 under the supervision of the Abbot of Montecassino, to mark the 1400th anniversary of the birth of St. Benedict. Since that time called the Jubilee Medal. 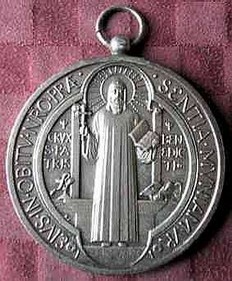 On the face of the medal is the image of St. Benedict, in his right hand he holds aloft the cross and in his left hand he holds the Rule; on a pedestal to the right of St.Benedict is a cup from which a viper runs away (to remember the poisoned wine from which he escaped miraculously); and at his left a raven about to carry away a poisoned loaf. Under the pedestal we read: Ex S. M. Cassino MDCCCLXXX (From the Sacred Mount Cassino 1880). 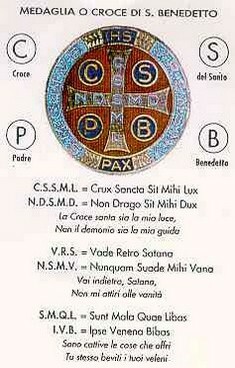 On the two sides: Crux Sancti Patris Benedicti (Cross of the holy father Benedict). Around the image: Eius in obitu our praesentia muniamur. (Defend us with your presence on our death). On the reverse of the Medal is a Cross. Between the four arms are the letters C.S.P.B, that they repeat the wording Cross of the S. P. B. (Holy Father Benedict).The vertical part of the cross has the initials of the first half of the verse: Crux Sacred Sit Mihi Lux (Sacred Cross be my light); the horizontal part has the initials of the second half of the verse: Not Draco Sit Mihi Dux (the demon be not my guide). On the circular band are the initials of the following words: Vade Retro, Satana, Numquam Suade Mihi Vana; Sunt Mala Quae Libas, Ipse Venena Bibas (Go back, Satan, do not induce me to vain things; harmful is your drink; drink yourself your poison). Above the Cross-is written PAX (peace): the motto of the Cassinese Congregation and later of all the Benedictine Order. The three aforesaid verses, they are a part of a very ancient series, at least XIV century, which accompanies the figure of a monk that with the cross sends away the temptation. They express the confidence of believers in the patronage of St. Benedict against the spiritual and materials dangers that the demon could cause. A researcher has affirmed that, with the exception of the SS. 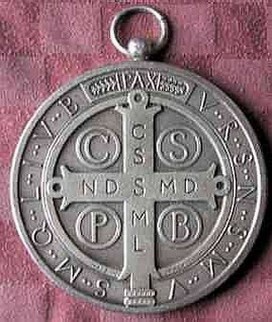 Virgin's medal, no other medal is so diffused like the one of St. Benedict. The numerous indulgences, of which the Holy See has enriched it, testify the great esteem and contribute to make it dearer and precious to the Christian people.